Purge Valve Kits keep the supply of fresh liquid nitrous at the solenoid(s) for instant and repeatable nitrous injection. This purge kit bleeds accumulated nitrous vapor from the supply lines. Includes solenoid, activation switch, filter, aircraft-quality fittings and wiring. The Bottle Nut Combo Wrench is one handy item to keep with your bottle. Compatible with all nitrous brands, it fits in your glove box, under your seat, or even in your pocket. This wrench features 3AN, 4AN, 6AN, and 1-1/4” bottle nut wrenches all in one convenient package. Black anodized aluminum and laser etched for a sharp, clean look! The Edelbrock Flow Test Tool is used to ensure that you have adequate fuel pressure for your nitrous system (measures flowing pressure). This tool features an easy-to-read fuel pressure gauge, a variety of jets to set the correct flow restriction, and easy attachment to your existing fuel line. The Tube Bending Tool makes installation of those tough-to-bend direct port nitrous lines a breeze. Get a professional looking installation every time. Can also be used on other 3/16” hard lines. 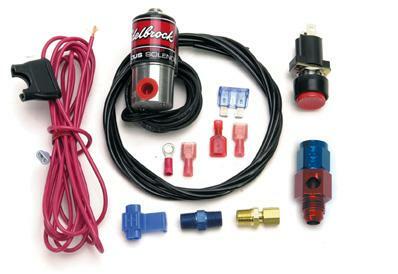 The Edelbrock Relay Assembly is a replacement harness used to transfer a nitrous system into a different vehicle or with many other devices, which require a wide open throttle activation. The Remote Arming Kit allows you to open and close the bottle valve with the flip of a switch from inside the driver’s compartment. The Nitrous Blow-Down Tube, and Blow-Off Adapter & Safety Valve is CNC-machined Racer Safety Blow-Off Adapter replaces the standard safety valve to allow for the use of a hard line blow-down tube like the Edelbrock Nitrous Blow-Down Tube. At 22” long, our blow-down tube is longer than most competitors’ tubes for easier installation. #72901 is a direct replacement for the safety valves that come with all Edelbrock nitrous bottles (5-lb. and larger).